What’s up everyone? Today’s ingredient will be lobster. In the Caribbean, our lobsters look different and are genetically closer to crayfish and prawns. Its only called a lobster if it has claws, in the Caribbean they don’t have. 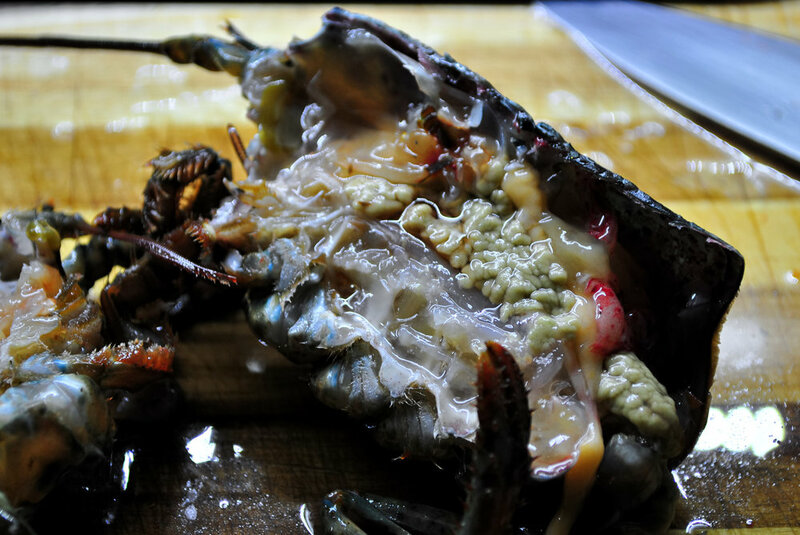 In this post, I will make this intimidating delicacy seem easy to clean, shell, and cook. You always cook lobster low and slow. If you put lobster on a surface that’s too hot it will contract and curl. It’s the same principal with fish but unlike fish, you can’t hold down lobsters until its relaxed. Generally, you put a skewer or stick through the tail to prevent curling when its cooking. This goes for when it’s in or out the shell. Always have your water boiling and ready before you start this process. When I buy lobster, I get it fresh and alive. There are people out there who feel that the process of killing a lobster is harsh. If you are that concerned, my best suggestion is to put the lobster in the freezer for maybe 15-20 minutes. I found out this almost puts them in a coma. Once you have done that you are going to take the claws and tails off. I put the knife through its head vertically and then continue the process as fast as I can. If you have a pair of strong kitchen shears, you can use those to cut the claws off. 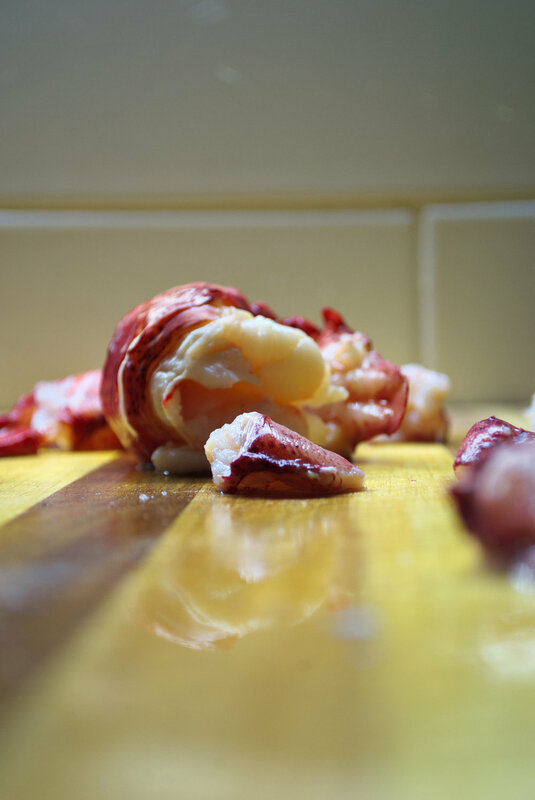 If not just use your Chef knife and press against the lobster claws on a cutting board, and give it a hit with your hand. Now that I have given you a quick debrief about the prepping process, we can fast forward. Give your ingredients a rough chop, place in the pot, fill with water and bring to a boil. 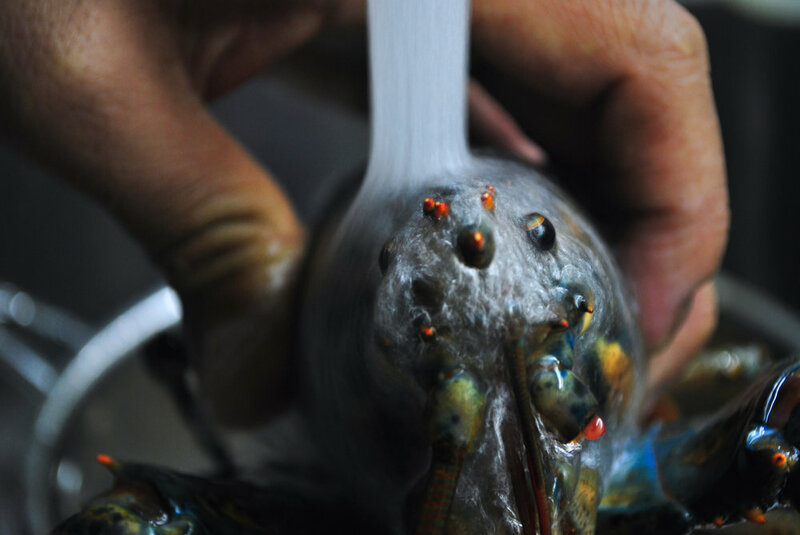 Once you have separated your lobster, take a skewer and put it through the tail and set aside. This will take the longest to cook so what you need to do is put it in first and then half way into the cooking process you can add the claws. I put my lobster tail in for 2 minutes because it was small. Essentially what you are trying to do is separate the flesh from the shell. Once my tail was in for 1 minute I dropped in the claws. 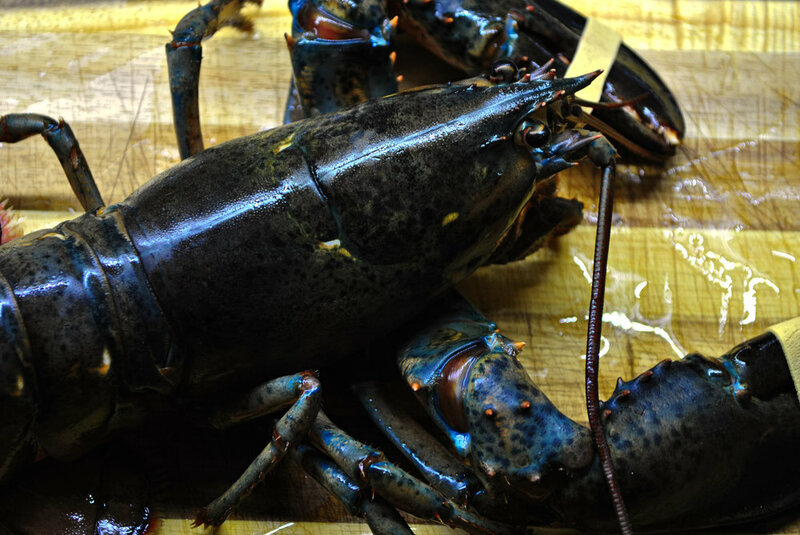 Get an ice bath ready to cool down the lobster as fast as possible. Once they are cooked, put them in the ice bath. Time for the dirty work. Remove the skewer from the tail. Place the lobster tail on its side and give it a press. This will perfectly split the bottom of the tail. You are then going to take the tail and hold the underside with the back of the shell towards you, and press outwards. The shell will split perfectly in half. If these instructions are too complex you can just use shears and cut the shell in half, be careful not to damage the meat too much. First cut the joints off the arm of the lobster, be sure to try and get the shears between the flesh and the shell. For the claws, you are going to need your knife. First take the moving part of the claw and constantly “Wiggle” or move it to separate the inner cartilage from the flesh. You are then going to pull off the joint. Next you are going just chop the tip of claw, and the base. You should be able to shake the flesh out. Be careful not to damage the flesh. Please note: I am from Antigua and Barbuda where Lobster weren’t always considered a delicacy. Due to over fishing we have a season now. Reason I am saying this is that we must not over fish our oceans and seas. Too much of anything isn’t good for the environment everyone. So please make sure whatever seafood you purchase isn’t a breed that is being over fished and is environmentally friendly to the Eco system.